Annuals are a place where creators can try out new things with characters they love. They aren’t constrained by the plot for an ongoing series, but they are able to explore something new. 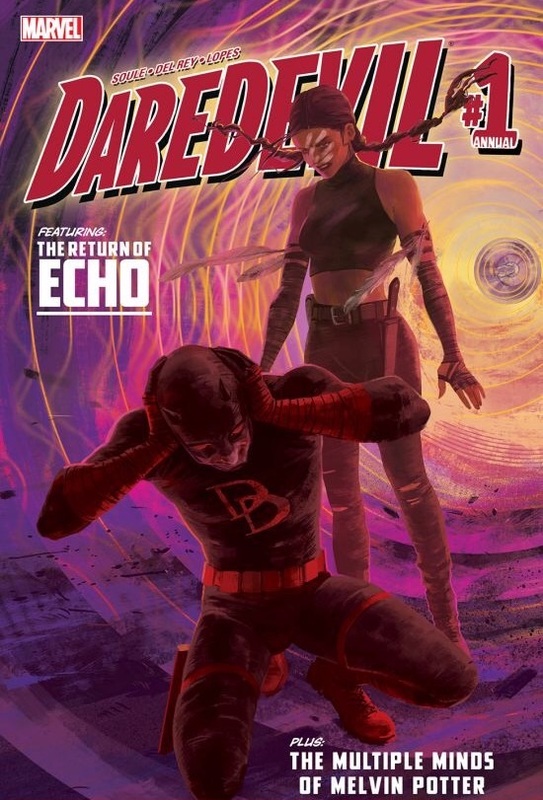 Charles Soule and classic Daredevil writer Roger McKenzie are given an extra page count to bring back not one but two classic Daredevil characters – Echo and Gladiator. It’s always a pleasure to have old characters brought back into a new light Sadly, this annual does not even focus on Echo or Gladiator much. The cover boldly says THE RETURN OF ECHO, yet there’s very little done for her character. While it’s nice to see her in the first chunk of the annual she is quickly replaced by Gladiator in the next short story. Yet again, something that could have been done wonderfully but falls very flat. An annual brings an extra page count sure, but trying to write an annual focusing on two different characters plus your main character is extremely difficult. Soule and McKenzie tried to make something of a new start with this annual. However, their writing mashing together in the two separate short stories is a shame. Possibly, if simply one writer wrote both short stories it could have worked. Of course the best fix to this annual’s problem is to focus on either or with a character. Echo should’ve gotten a bigger entrance and arc within this comic since it was introduced as a RETURN! But they had to add someone else into the mix. Overall the writing is messy and simply all over the place with the multiple stories they are trying to tell. The shining part of this annual is the art done by Vanessa R. Del Rey. Her artistic style fits so well with Daredevil – the colouring and way the characters are drawn are so very the world of Hells Kitchen. The art alone could be worth the extra bucks it takes to purchase this comic. With a character like Echo, it’s important to show her vision while being deaf. Rey does this spectacularly by making the world feel a certain way. She makes the lines surreal and the colouring over the top yet simplistic. 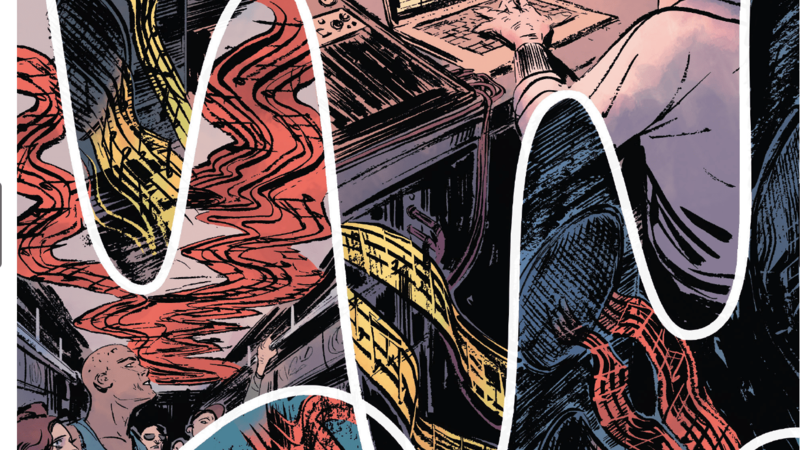 One of the best panels that showcases Rey’s art is when Echo duplicates Klaw’s song. 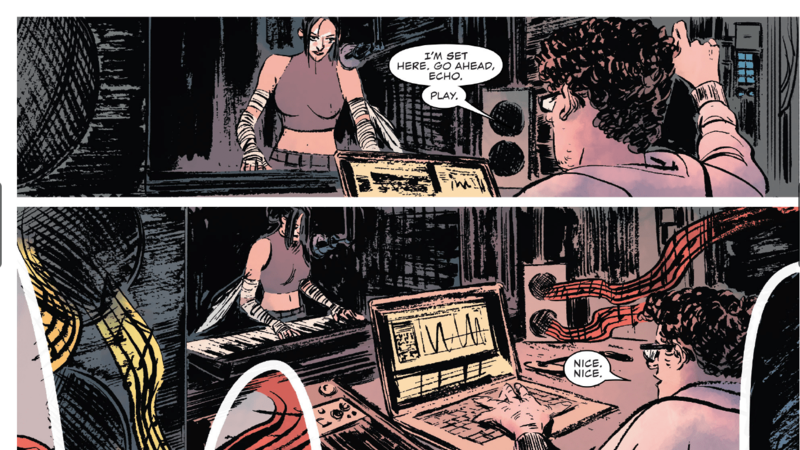 As a reader you are able to actually hear the echo of Klaw’s music that Maya provides. Her ability is showcased so well by Rey in this comic that new readers would for sure be marveled by her work. Even Ben Torres brings more to Gladiator than the writing does. His style is extremely different than Rey’s with very clear cut lines, nothing surreal and minimal vibrancy. Torres goes with blue and whites throughout which highlights Melvin Potter’s simple yet chaotic mind. 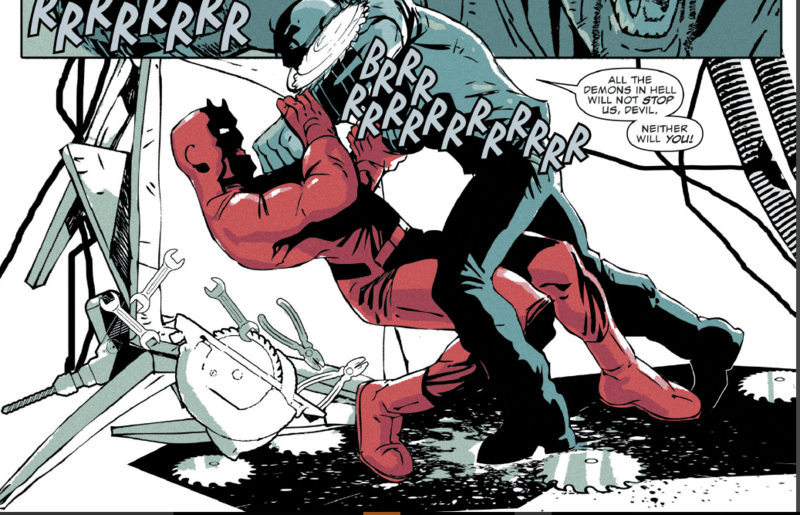 The only colour Torres uses outside of Gladiator’s plain colour palette is Daredevil’s bright red costume. The contrasts of their palettes is so vivid when they fight. The above shot is amazing – morally grey with a hint of fire. Rey and Torres both take two choppy stories and bring life to them. Sadly, even if you are a fan of Daredevil I’d say this is one annual you could skip. It’s an issue that is full of too many grandiose ideas trying to fit into a very small place. Even though they tried new things with characters, it sadly didn’t feel very new to me. As a fan of Maya (Echo) it was a let down to see her character be hyped up with very little payoff. If you are a new reader looking to enjoy Daredevil, say after watching the show, again I’d say this is not the place to pick the story up. I know starting comic issues can be scary but the extra bucks that comes with an annual are not worth it here. As a new reader, confusion would be extreme especially when introduced to two seemingly new characters. If you’re a comic fan who is into art I would definitely recommended this annual. But for that reason alone.